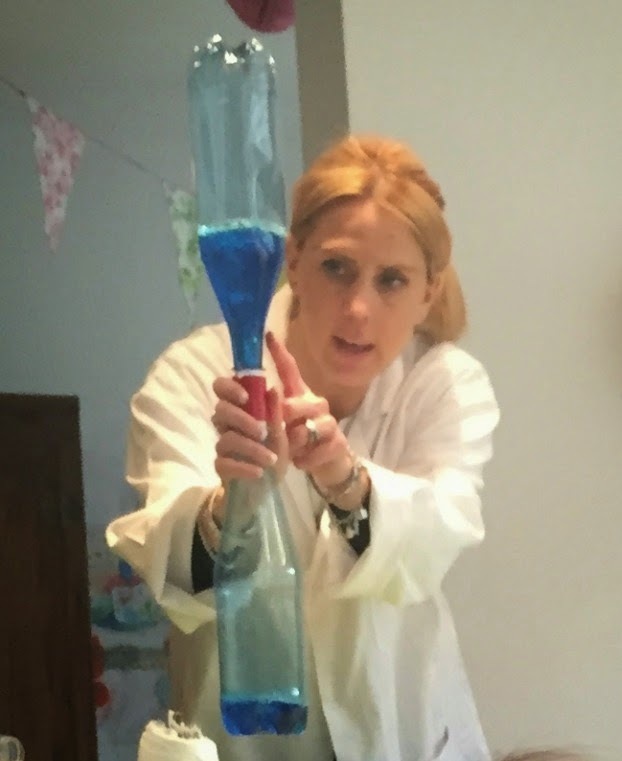 A Happy Healthy Mummy: Sublime science - for a party with a bang! Sublime science - for a party with a bang! A child's birthday is always reason to celebrate. For a start it gets the birthday child ever so much closer to 'that' ideal age they want to be (for mine it's 12 - the age I once said was suitable for ear-piercing) - and makes them feel all grown up (regardless of whether they are turning two, suddenly six, breaking into double figures or - LIKE FINALLY - becoming a teen). It's also an opportunity to make your child feel loved and special - and give yourself a sneaky pat on the back for a) keeping the child alive that long despite their best efforts and b) them not turning out so bad after all. As much as OTT kiddie parties have been in the news recently for extravagant pressies and invoices for absentees, it's always nice for your child to see in their new age with some close, personal friends. Often about 20 of their closest friends in fact! But finding new and interesting places to go, or themes that haven't been done to death and adapting to their changing interests can be a struggle. You might well be sick of play centres and pass-the-parcel too - and long for the day your child no longer dreams of a complicated cake combining My Little Pony, Tinkerbell and the colour red (I have learnt that sometimes it's best not to ask...). This year, after much, much deliberation (and ruling out the possibility of forgoing a party for a mini-break down to Gweek to visit the Cornish Seal Sanctuary - over a 4 hour drive away...), I looked into the possibility of having a science party. I went down the route of hiring someone in to run the party as demonstrating even basic science principles is well beyond my capabilities - let alone doing it alongside providing food and ensuring general good order! And just to add that little frisson of extra stress we opted to have the party at home (where we are currently having building work, so part of the kitchen is in the dining room - and rather a lot of building materials are engaged in a prolonged sleepover in our spare bedroom). After a frantic few days hoovering up dust, bubble wrapping some rough-edged walls that were a head injury waiting to happen and improvising a cardboard floor to conceal pipes and wires, we were ready for the Sublime Science party host to pop up in her lab coat and safety googles (that's for the party, not because of our building work!). The host needs about 15 minutes, a table and access to electricity to set up the interactive show. In our case, the very lovely Sharon-Anne got all the kids to sit down as she kicked off the fun - and showed a range of experiments that demonstrated chemical reactions, sounds and vibration, fluid dynamics and air flow. 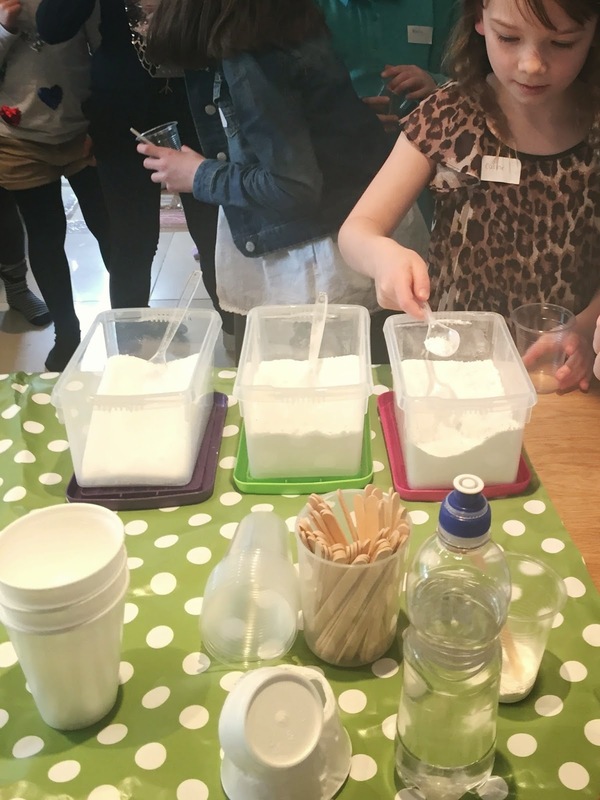 From the kids point of view, this meant plenty of opportunity to mix up potions, try out some of the experiments demonstrated, touch the finished creations - and several team races measuring air and using a 'tornado' to empty a bottle. The demos were very active and hands-on - the children were encouraged to ask and answer questions (they quickly reverted to school rules and patiently put their hands up - I'm sure their teachers would have been proud!). The children each made sherbet (consuming it on site) - and slime (which they each took home). The birthday girl herself got to be the 'glamourous' assistant for many of the experiments too (but often had the difficult task of choosing a friend to go next) - and even mummy and daddy got to join in the races (I should add that my team won both times, in your face daddy!). I really enjoyed trawling Amazon for the party bags too - alongside the usual sweets - there was plenty of affordable 'science kit' on offer, including test tubes, petri dishes and litmus paper. I even found some stationary decorated with the periodic table and Science themed cups, plates, napkins and bags too. 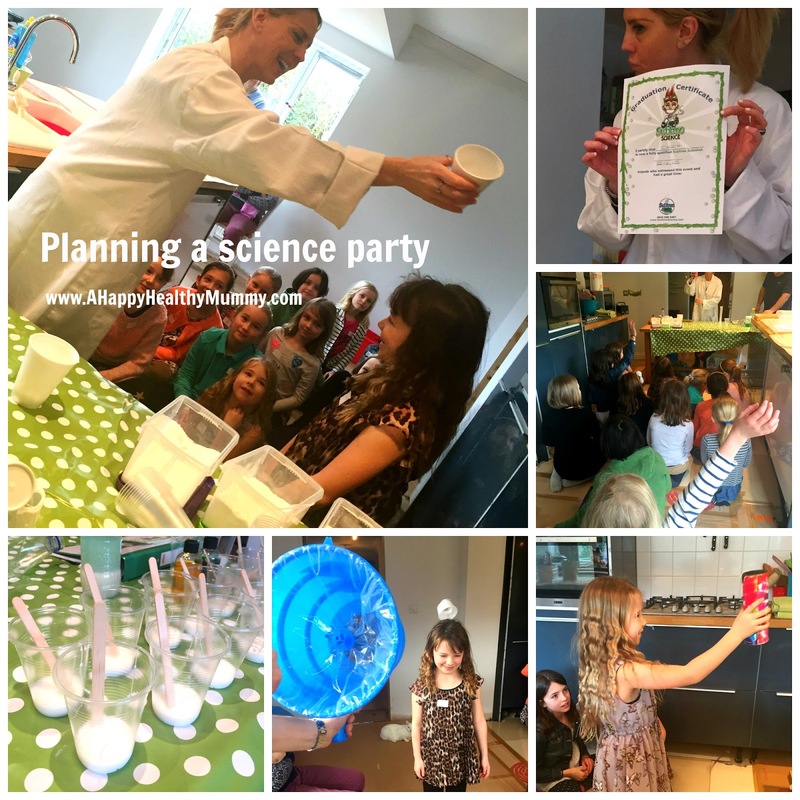 I'm obviously not the only parent to think a science party ticks a lot of boxes! In all, the party was a success, the kids behaved impeccably (I assume because they were all enthralled with the scientific demos - and because they have the best parents ever, some of whom might be reading this...) and the event went without a hitch. I loved the fact the kids had learnt something but still had fun - and thought our presenter was great with both the kids and the technical aspects of the experiments. My daughter had a great time joining in the entertainment and finding out about science. Who knew a party planned around a chemistry lesson would get such a positive 'reaction'!!! What's the best party you've organised? Or do you suffer from party fatigue? Have you had any last minute disasters - or do you love an excuse to celebrate? Share your experiences - good and bad and especially if they're funny - in the comment box below. Thank you! Funnily enough my son's birthday party is coming up on Sunday! Wish I had read this earlier as I am sure he would have loved a science party. We have gone for an animal party. A lady is bringing over her menagerie of small, furry pets for the children to pet and look after. Think we might have to lock up the cat! For the first time ever, we have gone for an intimate party - my son really is only inviting six of his closest friends... so hopefully it won't be as manic as usual! Science party can be fun and best learning experience for students. As it won’t get bore for them and students can have fun while learning. I also had been to similar event at New York event venues and it was actually a great experience.